27.9.1929: The Board of Kingston Steam Trawling Co Ltd requested Cook, Welton & Gemmell Ltd to submit a design for a new class of trawler for use on the North Sea and Faroes grounds. 18.12.1929: Design was approved and contracts signed with the shipyard to build the ships and with C. D. Holmes & Co Ltd to make the engine and boiler at a total cost of £14,025. The name chosen was AVANTURINE (Yd.No.542). In the tender the shipyard included the option to build additional vessels to this design at the same price. 19.1.1931: The option was exercised and a further two vessels ordered, the price agreed was £13,850 and names chosen SIBERITE (Yd.No.564) and EUCLUSE (Yd.No.565). 20.1.1932: Two further vessels were ordered the price agreed being £13,450. The names chosen were ALMANDINE and PYROPE. Total cost for ALMANDINE, with amendments, fishing gear and other equipment £14,024.11.10d. 5.4.1932: Launched by Cook, Welton & Gemmell Ltd, Beverley (Yd.No.572) for Kingston Steam Trawling Co Ltd, Hull as ALMANDINE. 30.4.1932: Registered at Hull (H415). 12.5.1932: Completed (John William Lown, manager). 14.5.1932: Sailed on first trip to Faroe grounds. 4.8.1932: Landed 641 kits of herring grossed £361. 19.10.1933: In strong SSE wind connected to trawler DE LA POLE (H395) disabled with fouled propeller. 20.10.1933: Delivered Hull (awarded £250 by Hull Steam Trawlers Mutual Insurance & Protecting Co Ltd). 19.11.1938: On St. Andrew’s dock slip fitted with bronze propeller. 30.5.1939: In Princess Dock, Hull. Boiler fitted with superheater by C. D. Holmes & Co Ltd.
29.8.1939: Admiralty telegram informing owners that ship would be requisitioned at 5.00 pm. 30.8.1939: Requisitioned for war service (Hire rate £162.5.0d/month). 1.9.1939: Sailed for London with RN crew. Fitted out as a minesweeper (P.No. FY645). 1940: Based Grimsby with M/S Group 40 (Ch. Sk. A. Robb, RNR). 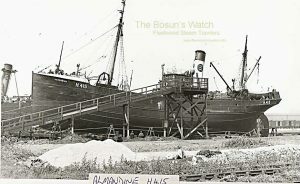 10.2.1940: Steam trawler THERESA BOYLE (GN4) (Sk. 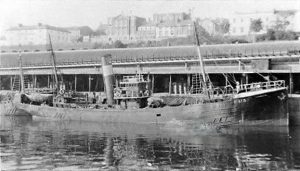 Oliver Bell) damaged by German air attack when fishing 115 miles ExN of Aberdeen. Took to boat and vessel foundered. 12 .2.1940: At 4.30 p.m. RAF aircraft overflew boat, rocket fired. Aircraft communicated with HMTrawlers BRABANT (GY544) (P.No.FY.690) and ALMANDINE (H415) (P.No.FY.645), ‘sweeping 10 miles away. After 50 hours in open boat picked up by ALMANDINE and landed at ?? at 6.00 p.m. all crew suffering from exposure. 1.1941: At Grimsby (Ty/ Sk. S. A. White RNR). 5.1.1943: Returning in company to the Humber in a storm with snow squalls, stranded on a sand bank. Spurn lifeboat attended and at great risk to herself took off nineteen crew and landed them on the beach. Refloated on flood, tug connected and after taking off three remaining crew, proceeded to Grimsby. 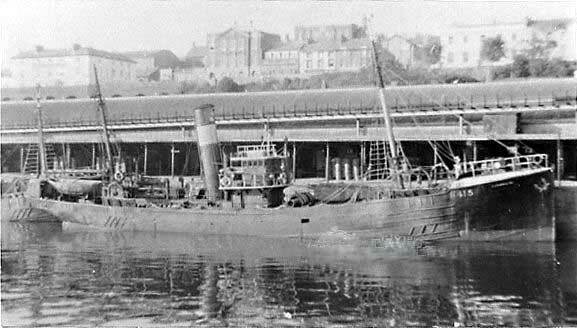 10.7.1945: Off Lizard Point, Cornwall picked up eleven survivors from HM Trawler KURD (H344/P.No.FY639) (Ty/Act Lt Cdr Roy Barratt RNR) which had been mined with loss of sixteen crew including CO*. 22.5.1946: Returned after refurbishment at Hull by Stewart & Graig Ltd.
22.5.1946: Sailed on trip to Faroe grounds. 30.9.1948: Sold to Milford Fisheries Ltd, Milford Haven (Owen W. Limbrick, manager) for £27,500. 10.1959: Converted for burning oil fuel, F.P. above 150° F.
16.2.1960: Reginald James Parry appointed manager. 17.2.1962: Sold to Hammond Lane Metal Co Ltd, Dublin (Donald James Flavin, manager). 2.3.1962: Sold to Mrs Daisy Pretoria Carter, Milford Haven (Alastair Adams, manager). 1962: Laid up at Milford. 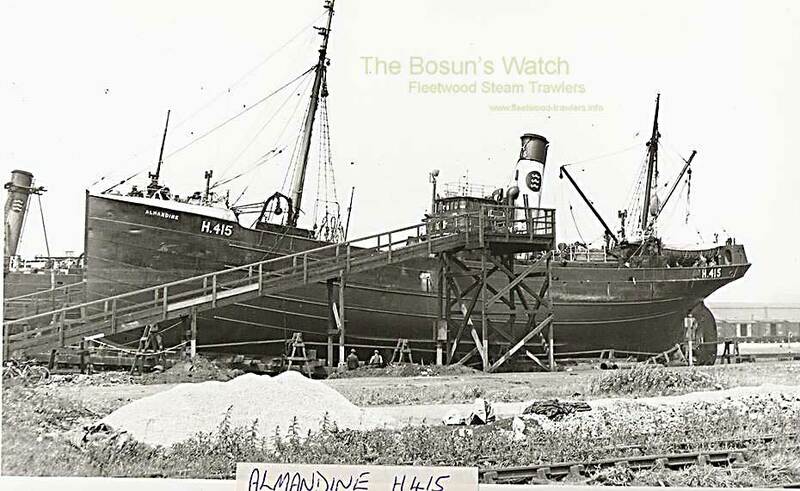 10.6.1963: Sold to Boston Deep Sea Fishing & Ice Co Ltd, Fleetwood (Basil A. Parkes, manager). 10.1963: Sold to West of Scotland Shipbreaking Co Ltd, Troon for breaking up. 7.12.1963: Arrived Troon Harbour (draughts 6’0”/15’3”). 15.6.1964: Hull registry closed “Broken up”. 08/05/2018: Removed FMHT watermarks from images. This entry was posted in Steam Trawlers, Steamers (Picture) and tagged Boston DSF & I, Parkes on May 20, 2012 by Fred Smith.